YESTERDAY, EIR ANNOUNCED that they were withdrawing their bid for the Rural Broadband Plan, which has sparked claims that this would both speed up and slow down the rollout of high-speed internet connections across Ireland. Eir has already rolled out fibre broadband – which is a higher quality, higher speed broadband, to 70% of homes across Ireland – with about 540,000 homes and businesses still remaining to be connected. Eir, having proceeded with its own rural broadband rollout which took 300,000 premises off the list for the State-subsided National Broadband Plan (NBP), was thought to have been the most likely winner of the tender. We took this decision after a long process, it’s being going on for three years, and the contract that the process is based upon has been increasingly onerous… The overall investment environment was not conducive and we couldn’t make a business case stack up. So regrettably, we had to pull out. Moat denied that the company’s withdrawal for the latter part of the broadband rollout was connected in any way to French billionaire Xavier Niel buying a majority stake in the company in December last year. Eir are still in the process of rolling out fibre broadband to 300,000 homes in Ireland and are currently “half way through that”. Moat added that the rest would be connected by the end of the year, all going to plan. He addressed concerns reported by some that the homes that have already been connected don’t have a consistent connection and that multiple users can’t use the internet at the same time in some quarters. We’ve got 600 customers covered with an offering of 600Mbps, we’ve spent about €40 million in Galway alone. I understand frustration but we are still rolling out fibre to those areas right now. based upon the significant commercial issues and complexity within the tender process, together with growing uncertainty on a range of regulatory and pricing issues that reside outside of the NBP process. The company’s board has decided that the risks are too great for its continued participation in the NBP. Therefore, Eir has taken the difficult decision to withdraw from the tender process. “We went into this tender with intention of winning all of it or as much of it as we could,” Moat said this morning. 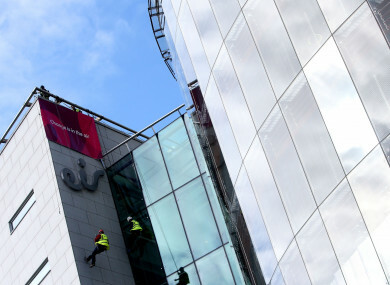 In a statement yesterday, Minister for Communications Denis Naughten said that Eir had decided to exit the National Broadband Plan because of “commercial, regulatory and governance issues”. The company invested significant time and resources to the process and their withdrawal from the process at this late stage is regrettable. Enet is now the sole bidder for the tender – yesterday it reaffirmed that it was committed to the project. “We recognise that this procurement is long and complicated, but we look forward to our continued engagement with the department on the remainder of the process,” Enet chair David C McCourt said. If they do win the contract, there will be a slight overlap between them and Eir as they take over the reins of the broadband rollout plan. In one example put to Moat, it was said that in cases where Enet needs to use Eir poles to continue the rollout of broadband, the prices of letting those out are already decided by the regulator, so there would be no delays caused by pricing disputes. Moat said that they haven’t spoken to Enet yet about what they would charge them to use other infrastructure already put in place by Eir – this is because up until yesterday they were both bidders for the process, and so weren’t permitted to speak with one another until the process had concluded. Taoiseach Leo Varadkar told reporters this evening that he is not sure of the implications of Eir’s withdrawal, but said the government is keen to conclude a contract. “Those 500,000 rural homes and premises are really important, as important as rural electrification back in the 30s and 40s and we are keen to concluding this contract and start laying fibre as soon as we can,” Varadkar said. Email “Why did Eir quit the State's broadband plan, and what now for rural Ireland?”. Feedback on “Why did Eir quit the State's broadband plan, and what now for rural Ireland?”.